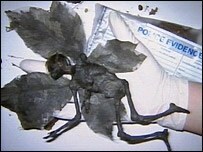 Weird Things » Blog Archive » Weird Wiki: How Much Would You Pay For The Corpse Of A Fairy? I love a good joke/hoax as much as next guy and when someone puts this much time and effort in creating a near-convincing sculpture or model such as this “fairy” I’ll be the first to applaud the creativity. One of my favourite artists is Alex CF (http://alexcf.com/) how make a living doing just this sort of thing. The collections of Alex CF inspire the playful suspension of disbelief and thoughts of “what if?” and that’s something that is lacking in this day-in age. However, when I come across comments like the following….. I truley believe in the spirtual world, My son saw a fairy last year of 2009 in chicago ill. outside of popeye chicken located at 113s.Halsted,so for you non believe there are other Spirtual beings in this world,not only have my son witness things as his mother so have i.Respond back,this is not a hoax,This is very real. ….I get rather worried. Because from here its just a short hop, skip, and freak-out into a full blown religion. Either that or children grow up with some really F*ed up parents and that’s what really has me on edge, because I’ve seen the results of that first hand. Its people like that are one of the reasons I’ve been a skeptic since I was old enough to formulate my own opinion.